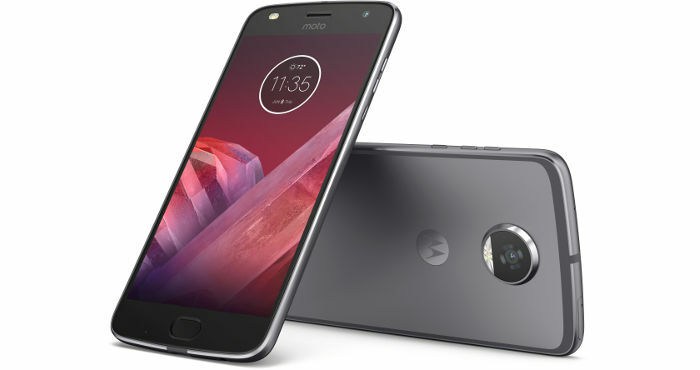 Last year, Motorola launched its popular line of Moto Z line of smartphones that distinguished themselves with Moto Mods, magnetic accessories that transformed the phones into projectors, speakers and more. And, now, it’s time for round two, as the company launched the second-generation Moto Z2 Play this week along with several new Moto Mods. Motorola announced that the thinner, lighter and faster Moto Z2 Play runs on Android 7.1.1 Nougat and is powered by a 2.2-GHz octa-core Qualcomm Snapdragon 626 processor, up to 4 GB of RAM and up to 64 GB of storage packed into an all-metal unibody case designed to withstand the rigors of daily use. The phone boasts a 5.5-inch Full HD Super AMOLED screen for sharper and vibrant visuals. Its 3,000-mAh battery promises about 30 hours of power on average use. When fuel runs low, top up your phone quickly with up to eight hours worth of power in just 15 minutes of charging. The Moto Z2 Play's 12MP main camera uses a combination of laser autofocus and dual pixel autofocus, so your photos come out bright and sharp even in low-light situations. The laser autofocus has a range of five meters, allowing the camera to focus on subjects three times further in dark environments. The Moto Z2 Play also comes with a 5-megapixel front camera with a dual, color-corrected flash to ensure that your selfies appear awesome day or night. Other new enhancements include a Night Display feature, which uses warmer tones on the screen at night to reduce blue light exposure and a redesigned fingerprint reader. More Moto Z2 Play fun comes with Moto Mods, introduced last year along with the first-generation Moto Z series. These add-on accessories or modules can give your phone a unique look or extend phone abilities in transformative ways. Built-in magnets let you attach a mod without any fuss to the back of your Moto Z2 Play. Moto GamePad — Clip on this mod to the back of your Moto Z2 Play to morph it into a handheld gaming console with dual control sticks, D-pad and four action buttons. It comes with a built-in 1,035-mAh battery pack. The Moto GamePad will be available this summer for $79.99. JBL SoundBoost 2 — This is the second-generation stereo loudspeaker mod that Motorola designed in partnership with JBL. This fabric-covered, splash-proof mod comes with a built-in battery pack for about 10 hours of audio playback. It comes in red, blue or black and has a built-in kickstand. The JBL SoundBoost 2 will be available this summer for $79.99. Moto TurboPower Pack — This power bank lets your Moto Z2 Play quickly top-up your phone’s power from its 3,490-mAh battery. When the power bank itself runs out of power, just plug it in to replenish up to 50 percent of its power in just 20 minutes. The Moto TurboPower Pack will be available this summer for $79.99. Moto Style Shell with Wireless Charging — This mod dresses up your Moto Z2 Play in various sleek and stylish designs while allowing it to use fast wireless charging. The shells come in several finishes, so you can choose one that suits your fancy. The Moto Style Shell will be available this summer for $39.99. JBL SoundBoost — This is the first generation of the speaker mod for the Moto Z series. It amplifies the phone’s audio in high-quality JBL stereo sound. It also has a built-in kickstand and provides additional 10 hours of extra battery life. Available in black and white on Amazon. Moto Insta-Share Projector — This turns your phone into a mini projector that can project videos and images up to 70 inches on any surface and from any angle. Available on Amazon. Hasselblad True Zoom — This add-on extends your phone’s zooming ability with true 10x optical zoom. It includes a Xenon flash for better shots in low lighting conditions, as well as physical shutter and zoom buttons. Available on Amazon. Incipio offGRID Power Pack — This mod adds up to 20 more hours of battery life to your phone. Wireless charging (Qi and PMA) is supported. Available in black or white on Amazon. Incipio Vehicle Dock — This magnetic phone mount is hassle-free to set up for use in vehicles. It is compatible with Android Auto and offers 15 W fast charging capability. Available in the Motorola store. Moto Style Shell — These are easy-to-attach and stylish back plates to give your phone the looks that suit you. Premium fabric, wood and leather styles available from the Motorola store. Mophie Juice Pack — Add 60% more battery life to your phone with this 3,000-mAh battery pack. When the juice pack runs out of power, you can fast-charge it separately or while attached to the phone. Available on Amazon. The Moto Z2 Play will be available in the U.S. exclusively on Verizon starting this July and on Motorola.com later this summer for $499. The new Moto Mods will roll out to stores globally this summer.